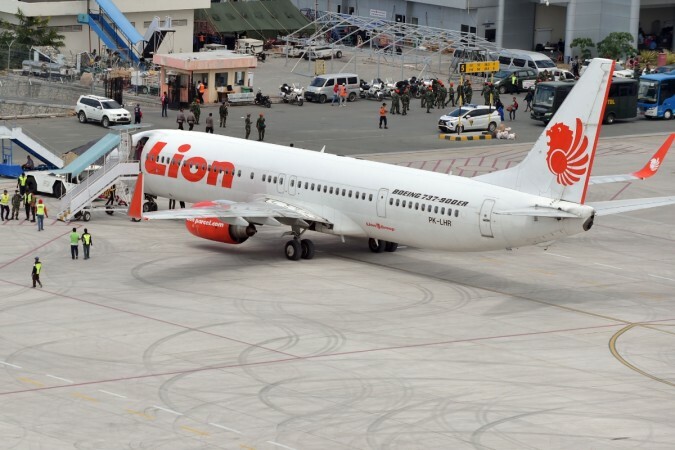 The Lion Air flight was on a domestic route and was on the way to the city of Pangkal Pinang on Sumatra. The aircraft is said to be a Boeing 737 Max 8, with 189 people on board, including 3 children and 8 crew members. An Indonesian passenger plane, operated by low-cost airline Lion Air, has crashed into the sea minutes after it took off from Jakarta. The flight was on a domestic route and was on the way to the city of Pangkal Pinang in Sumatra. The aircraft is said to be a Boeing 737 Max 8, with 189 people on board, including 3 children and 8 crew members. The Lion Air Group has now revealed the names of the pilots and the crew of the flight, reported the Guardian. The captain was Bhavye Suneja, a resident of New Delhi. Suneja parents have reportedly been informed of the crash and are set to fly to Jakarta tonight. He lived in Jakarta with his wife, who he married two years ago. The cabin crew were Shintia Melina, Citra Noivita Anggelia, Alviani Hidayatul Solikha, Damayanti Simarmata, Mery Yulianda, and Deny Maula. Indonesia's Search And Rescue Agency has released an official statement on the crash, but the cause is still unknown. "The cause of the crash of the 737 Lion Air Boing plane on the Jakarta-Pangkal Pinang route is still a big question," it says. "The Emergency Local Transmitter beacon on the plane did not emit a distress signal. Thus, the crash of the plane was not monitored by the Medium Earth Orbital Local User Terminal at the Basarnas [Search and Rescue] head office. "The aircraft beacon has been registered and declared good until August 2019. The crash location is around the coordinates 05.46.15 S - 107.07.16 E. 34 nautical miles from the Jakarta SAR office." Lion Air's CEO, Edward Sait, has now revealed that the plane had reported a technical issue on Sunday night, but insisted that the issue had been taken care of and the aircraft was declared air-worthy on Monday. A passenger's relative has now spoken to the Associated Press. "We are here to find any information about my younger sister, her fiance, her in-law to be and a friend of them," she said. "We don't have any information. No one provided us with any information that we need. We're confused. We hope that our family is still alive." The Indonesia Ministry of Transportation has confirmed it has located the wreckage of Lion Air Flight JT 610. The Boeing Company is deeply saddened by the loss of Flight JT 610. We express our concern for those on board, and extend heartfelt sympathies to their families and loved ones. Boeing stands ready to provide technical assistance to the accident investigation. In accordance with international protocol, all inquiries about aviation accident investigations must be directed to the Indonesia's National Transportation Safety Committee (NTSC). Indonesia's search and rescue agency has now tweeted about the incident and said that the emergency team has found ID cards and drivers licenses. Several pieces of Lion Air JT 610 aircraft has been seen in the sea. Lion Air has said that the pilot and co-pilot had a combined total of 11,000 hours flying time, reported Reuters. An official of Indonesia's safety transport committee has said that the cause of the crash cannot be confirmed until the black box is recovered and reviewed. "We will collect all data from the control tower," said Soerjanto Tjahjono. "The plane is so modern, it transmits data from the plane and that we will review too. But the most important is the blackbox." The crash is said to be the first involving a Boeing 737 Max aircraft and Boeing has said that it is closely monitoring the situation. Wreckage has reportedly been found near the place where the flight lost contact said Muhmmad Syaugi, the head of the search and rescue agency. "We don't know yet whether there are any survivors," Syaugi told a news conference. "We hope, we pray, but we cannot confirm." Singapore's Straits Times have reported that the plane had requested a return to base before it lost contact. The ATC had permitted it to return, but the aircraft is then said to have gone down. Twenty officials of Indonesia's finance ministry were on board. Flight tracking service Flightradar24 also said that a drop in the flight's altitude and an increase in speed was noticed before it lost touch with the air traffic controller. Lion Air is yet to issue a statement on the crash and told reporters that it was trying to get more information on what went wrong. "We cannot give any comment at this moment," the Sun quoted Edward Sirait, chief executive of Lion Air Group, as saying. "We are trying to collect all the information and data." Lion Air spokesman Danang Mandala Prihantoro added: "We can confirm that one of our flights has lost contact, its position cannot be ascertained yet." National Search and Rescue Agency (Basarnas) spokesman Yusuf Latief confirmed the crash and told The Australian that the Lion Air flight lost contact with the air traffic controller 13 minutes after takeoff. "A tug boat spotted what looks to be the crashed plane at 7.05am off the coast of Karawang, Bekasi," Yusuf said, and added that a distress signal too was recorded. "It has been confirmed that it has crashed," he later told Reuters. Search and rescue teams have now been sent, but the casualties are yet to be ascertained. The low-cost airline, which started operations in 2000, has witnessed quite a few incidents in the past as well. Its planes have overshot the runway a few times and also have seen a few landing issues.